Recovery time took longer than expected, yet I guess that's what happens when one has 45,000 people(!) passing by a booth; what a grand parade! I felt like I was sitting in a bus, traveling the country and at the end of eight hours was exhausted for having done 'nothing.' Well, that's not exactly true as of the 45,000 quite a few folks did stop in and many new contacts were made, some pieces sold, and some still being pondered. 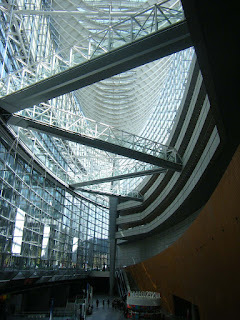 Visitors ran the gamut of Tokyo from little ones (one eight-year old pointed at me and told his mother, "that's the gaijin who was on NHK about Bizen!) 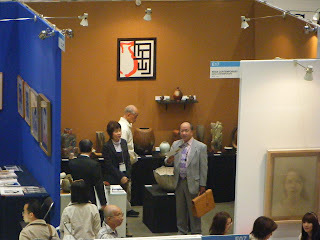 to the respected elders, of whom one couple took home a grand Wakimoto from us. All in all well worth it but for a few complaints. 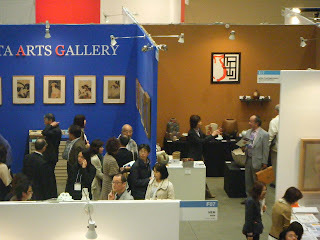 With over 100 dealers and a large layout not that well organized, visitors tired very easily not knowing what to expect as they passed each booth, afterall this was an art fair with everything from noble ancient Chinese pots to three-titted wooden pigs, and all in between---I'm sure you can imagine---with no discernible pattern. 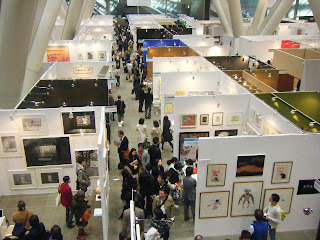 Luckily for my booth on one side there was a great Ukiyo-e booth (30 million yen Sharaku anyone? 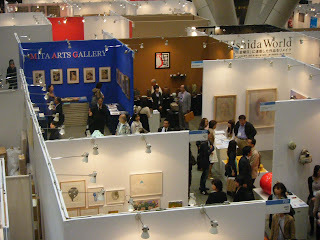 ), yet unluckily in the next booth was a huge painting of a yellow cow and then all kinds of assorted smaller paintings of the same ilk. Get the picture? And this was for the whole event. So, I'm hoping next year some order is prescribed and the cows and pigs will be in one area and we can hang with the more.......refined arts. And there you have it.